(1) Turn the ignition switch off. Wait for at least 2 seconds, then turn the ignition switch to ON. The SRS warning light comes on for approximately 6 seconds and the diagnosis of the airbag system (including the seat belt pretensioners) is performed. If malfunctions are detected during the primary check, the SRS warning light remains on even after the primary check period of approximately 6 seconds. 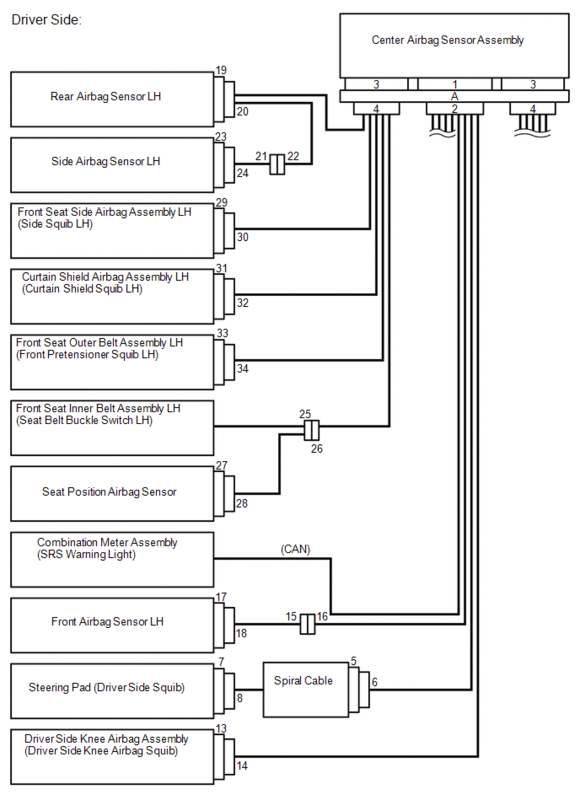 (1) After the primary check, the center airbag sensor assembly constantly monitors the airbag system for malfunctions. The SRS warning light goes off, and then comes on. This blinking pattern indicates a source voltage drop. The SRS warning light goes off 10 seconds after the source voltage returns to normal. The SRS warning light comes on only during the primary check period of approximately 6 seconds after the ignition switch is turned to ON. The SRS warning light remains on even after the primary check period. The SRS warning light does not come on when turning the ignition switch from off to ON. The center airbag sensor assembly keeps the SRS warning light on if the airbag has been deployed. (a) Turn the ignition switch to ON, and check that the SRS warning light comes on for approximately 6 seconds (primary check). (b) Check that the SRS warning light goes off approximately 6 seconds after the ignition switch is turned to ON (constant check). When any of the following symptoms occur, refer to Problem Symptoms Table (See page ). The SRS warning light comes on occasionally after the primary check period. The SRS warning light comes on, but a DTC is not output. The ignition switch is turned from off to ON, but the SRS warning light does not come on. 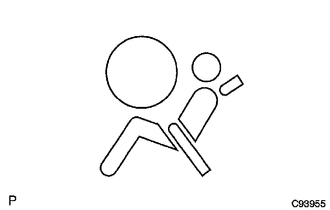 (2) The passenger airbag ON/OFF indicator comes on for approximately 4 seconds, then goes off for approximately 2 seconds. (3) Approximately 6 seconds after the ignition switch is turned to ON, the passenger airbag ON/OFF indicator will be ON/OFF depending on the conditions listed below. When the occupant classification system is malfunctioning, both the SRS warning light and passenger airbag ON/OFF indicator ("OFF") come on. In this case, check the DTCs in the airbag system first. Then troubleshoot the occupant classification system if DTC B1650/32 is detected, and troubleshoot the passenger airbag ON/OFF indicator if DTC B1660/43 is detected. (b) Check that the passenger airbag ON/OFF indicator ("ON" and "OFF") comes on for approximately 4 seconds, then goes off for approximately 2 seconds. Refer to the table in step 4 regarding the passenger airbag ON/OFF indicator when the ignition switch is turned to ON and approximately 6 seconds pass. 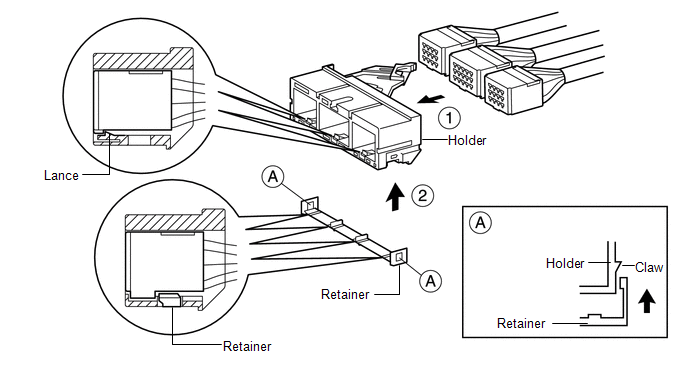 (a) SRS connectors are located as shown in the illustration. (1) This mechanism is designed to increase the ability of the terminal to remain connected and prevent it from accidentally being disconnected. (2) The connector has a two-piece construction consisting of the housing and spacer to securely lock the terminal using both the lance (primary lock) and spacer (secondary lock). (1) This mechanism is designed to prevent the connector from being connected only halfway. (2) If the connector is not completely connected, the connector is disconnected due to the spring force so that no continuity exists. 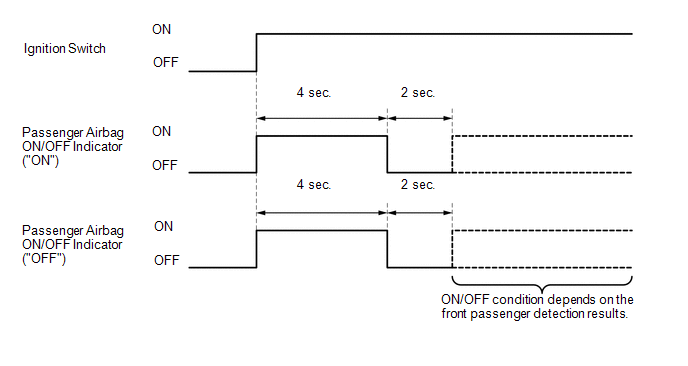 (1) The activation prevention mechanism is designed to create a short circuit automatically between the positive (+) and negative (-) terminals of an airbag power source connector when disconnected. 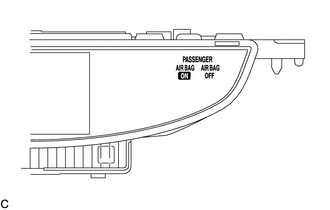 (2) The short spring plate contained in the connector creates a closed circuit on the airbag side (no potential difference can occur between both terminals), preventing accidental airbag deployment when servicing. 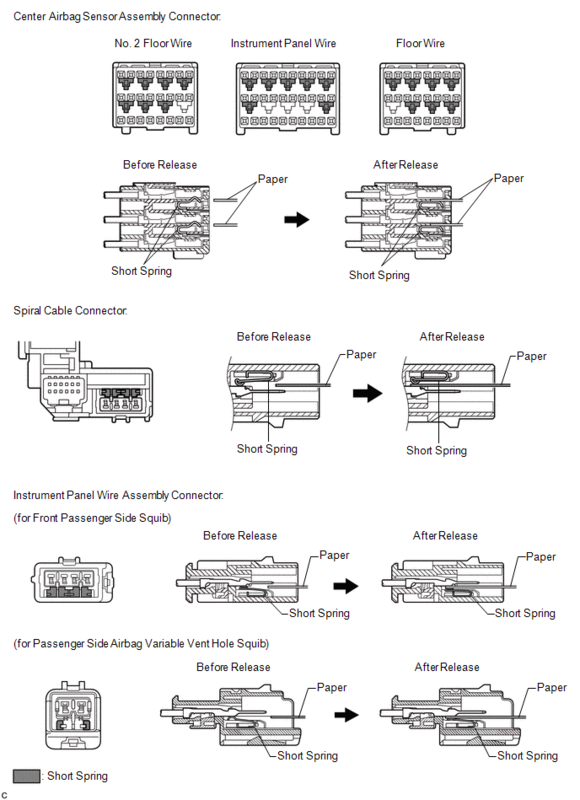 (1) This mechanism is designed to prevent the connector from accidentally being disconnected. (2) Locking the connector lock button engages the locking button claw to the groove on the other side connector to connect the connector securely. (1) This mechanism is designed to detect when the connector is connected only halfway. (2) The CPA and female connector slide to the male connector side at the same time and the primary lock is completed when the female connector is engaged with male connector. From this point, only the CPA slides to the male connector side and secondary lock is completed when the CPA retainer is engaged with the female connector. When the CPA and female connector ends are aligned, they are completely engaged. (2) Sliding the connector all the way into the holder and locking the lance completes the primary lock. 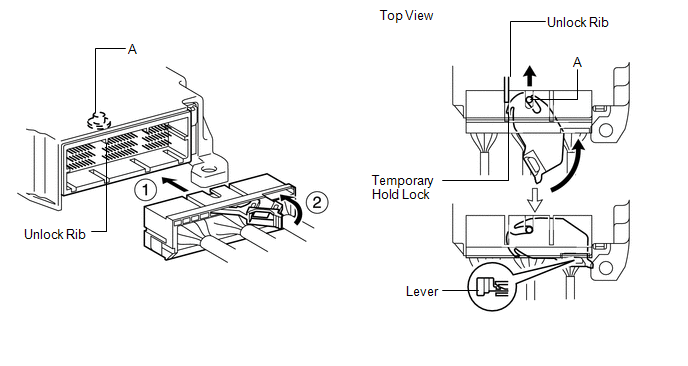 (3) Engaging the retainer to the holder as shown in the illustration completes the secondary lock, preventing the connector from accidentally being disconnected. (2) When the holder is connected to the airbag sensor assembly, the unlock rib unlocks the temporarily hold lock, allowing the lever to be pushed in by rotating around axis A. (3) Locking the lever to the holder locks the holder securely. 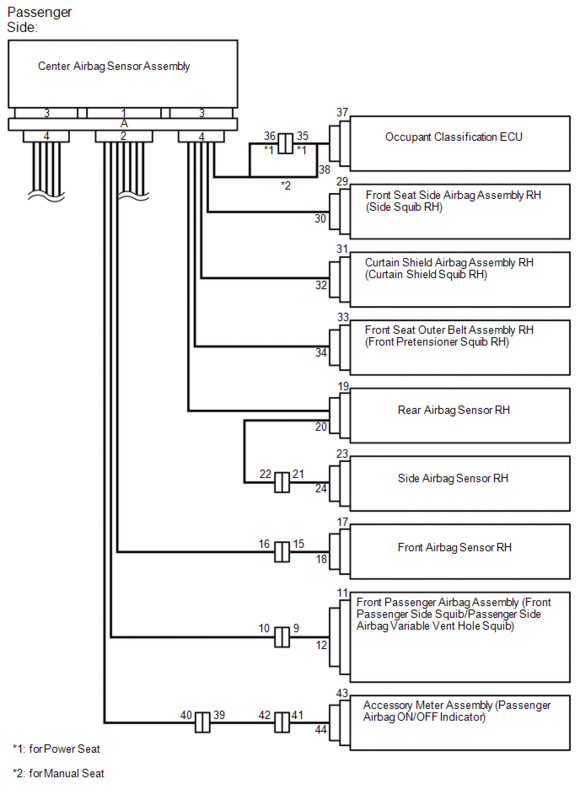 (1) An activation prevention mechanism is built into the connector (on the center airbag sensor assembly side) of the airbag system squib circuit to prevent accidental airbag activation. (2) This mechanism closes the circuit when the connector is disconnected by bringing the short spring into contact with the terminals and insulating the circuit from external power sources to prevent accidental airbag activation. (1) To release the activation prevention mechanism, insert a piece of paper with the same thickness as the male terminal (approximately 0.5 mm (0.0197 in.)) between the terminals and short spring to break the connection. (2) Refer to the following illustrations concerning connectors utilizing the activation prevention mechanism and its release method. Do not release the activation prevention mechanism unless specially directed by the troubleshooting procedure. To prevent the terminal and short spring from being damaged, always use a piece of paper with the same thickness as the male terminal.